For the first time in the history, this annual parasport event comes to Halifax, Nova Scotia! 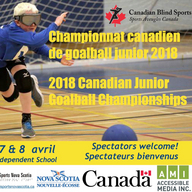 Blind Sports Nova Scotia and Canadian Blind Sports/Sports Aveugles Canada are proud to be hosting the 2018 Canadian Junior Goalball Championships. This unique & exciting parasport event brings up-and-coming junior goalball athletes from across Canada to compete for top spot in the growing sport of goalball. Spectators are welcome and admission to watch is free.